Bacteria developing on the surface of your pet’s teeth, the soft tissue of the gums and the bones of the jaw can cause serious infections in the kidney, liver, lungs, and heart. 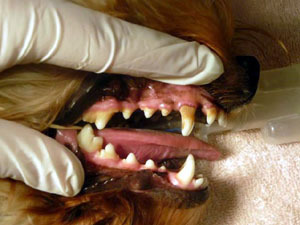 We recommend that your pet has a dental health evaluation at least once a year by our veterinarian. If our veterinarian determines any issues with the teeth or the gums, we can recommend a dental scaling, polishing, and extractions if needed. Preventing any issues is always easier than curing them once they’ve happened. We can show you how to brush your pet’s teeth to help prevent tarter buildup or recommend special foods or treats that will help fight it.